The owner of the Club de Hockey Canadien de Montréal George Gillette and Montreal businessman Joey Saputo said this week that they were working together to bring a Major League Soccer franchise to Montreal. That’s cool. People in Montreal are loving soccer. Support for Saputo’s Impact soccer team of the struggling United Soccer League is very strong and a new 15 000 seat stadium is being built for the team in the eastern part of town. MLS itself is a league on the rise with no less than David Bekham now playing for the Los Angeles Galaxy. One thing bugs me, though. In every story I read about this news item, Montreal’s new Major League Soccer team is called Montreal FC. As in Montreal Football Club. I don’t know if M. Saputo and Mr. Gillette have expressed their preference for that name or if it’s only a coincidence, but Montreal FC is a really bad name for a soccer team. Common, now! I get it! I understand those who want a name that recalls the great FC’s of international soccer, but I don’t think Montreal should have a soccer team with an English name, and I don’t think I should have to explain why. FC is lame. It’s so lame it’s what Toronto’s team picked as a name. If Montreal wants to look to Europe for inspiration, I think l’Olympique de Montréal is the obvious choice. CF for Club de Football de Montréal? Get it? The name is directly inspired by the truly glorious Montrealers: le Club de Hockey Canadien de Montréal – That’s what the CH on the jersey and tattooed on your heart stands for. CF makes you think of Canadiens-Français, so federalists can’t claim it’s covert separatist propaganda. CF Montréal instead of Montreal FC is a name that will hint at Québec’s and Montreal’s frenchness without the cruelty of forcing Anglophones to say words like Alouette. 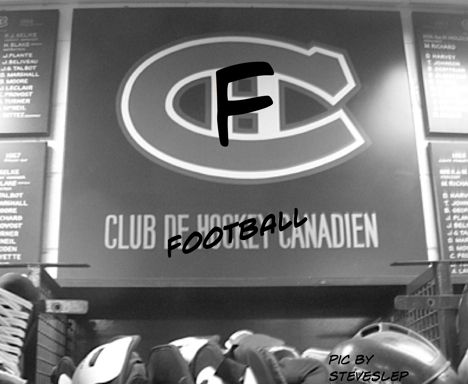 It’s in French yet “Club de Football” gives the name that true franglais feel that all Montrealers can bond around. Plus, it’s obvious. CF Montréal instead of Montreal FC. People will get it. Or how about AC Montreal, for Associazione Calcio Montreal? It’s neutral ground, being neither French nor English, and still is very Montreal as italian has long been Montreal’s strong third language. Furthermore, the role of Montreal Italians in Québec soccer is undeniable. Unless you’d rather go with another another classic Football club name: Montreal United. Right. Montreal United. All Montrealers, Franco, Allo, Anglo united around a united team. Montreal United… Or will it be l’Unité de Montréal? And then they’d have to do one of those silly graphics that kind of looks like a D but at the same time kind of looks like an accent aïgu and a Fleur-de-Lys…. At some point in the mid-eighties something odd happened. Half the kids around the world suddenly decided they wanted to be black. For some still mysterious reason, young people of every ethnic origin and language recognized themselves in the sounds and colors that were at that very specific time coming out of New York City. The Bronx, to be more specific. The South Bronx to be exact. Somehow out of the concrete, poverty and crack violence that plagued that place and time an uncontrollable epidemic of art and sound sprang out. At twice the speed of Rock and Roll, massive murals of graffiti covered the walls of cities worldwide and the sounds of a culture called Hip Hop infiltrated every record collection. Hip Hop became a worldwide culture, but a culture that could only express itself in the reality of one’s environment and personal struggle. To be Hip Hop was to be Real and to Represent. 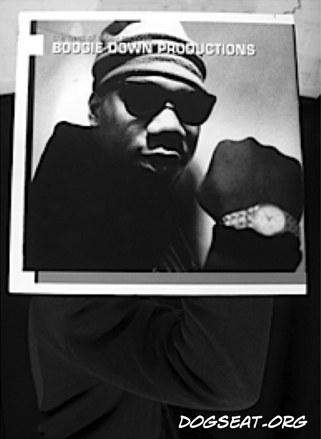 Hip Hop legend KRS-One is now in his third decade of representing the South Bronx around the world. The one who calls himself the Teacha was in Montreal on March 9th and spoke to the AngryFrenchGuy from a hotel room in New Jersey a couple of days later. I’m thinking of when you said « I manifest as a black man, but I’m universal. » When I was young that made a lot of sense to me. Today, how do you balance being an African American and just a human? To tell you the truth I’m more Hip Hop than African American. I think that’s where the balance comes from, that there really is no balance. African American, I don’t know what that is, really. I can’t put my hand on that. I know what it is politically, I know what it is spiritually, but I don’t know what it is in reality. How does it affect my life? Where’s the African American constitution? What is the collective African American goal? What is our set of ethics? Who are our heroes? I don’t see that in the African American community. I don’t even know if you can call it a community for that matter. What is our collective interest as African Americans? What do we all want? I don’t see any of that jumpin’ off. But I can answer thee questions when it comes to Hip Hop. I find the way you define Nation interesting. Where I come from, Nation is a very charged word. Is Québec a Nation? How do you define the Hip Hop Nation? A nation is a glorified community. A nation is any group of people who say they are a nation and can sustain their nationality. When you speak of the Hip Hop group in world History… project your mind to 2200. We’re all gone. 2200 is looking back on a specific period of time when this movement was created and flourished. Now Hip Hop may not exist in 2200, but everything we’re doing today will. Hip Hop may not be practiced anymore, but everything we’re doing right now: the rhymes, the DVDs, Cds, the live performances, the scandals, the newsworthy stuff… All of that will be in existence in 2200. Our offspring is gonna be looking back on our activity today for their heritage. This begins the mechanics of our civilization. If you’re a Philosopher, this is the greatest time in human history. This is the age where new cultures are born. New civilizations come into play. This is nothing to do with nationalistic thought, or militarism leading to some sort of terrorism, far from that. This has to do with the need of the people. Worldwide people are crying out to be relieved from having to communicate through race, through ethnicity, through class, through gender, through their job, through their degree… I respect these things no doubt! But those who have this blood or this awareness of Hip Hop they can transcend their race or their class and achieve great things in this other community. Is that how you explain the international appeal of Hip Hop? That it travels all over the world because people recognize something central in it? The only thing I would say for the sake of scholarship is that Hip Hop met in America. Met in the Bronx. Hip Hop didn’t really start in the Bronx. Hip Hop has always been in the world at different times. It just becomes more concentrated at certain places. Hip Hop met in the Bronx in tough time for the black community in the end of the 70’s and 80’s. How do you feel minorities are doing right now, either blacks, Latinos, Asians or new minorities? We didn’t know that we were living badly ’till we got money. To say that was a low period in African American life, to answer your question I would say no! I don’t think the African American experience has changed from slavery to now. And I don’t mean to say that slavery is the backdrop of all African American History. As a matter of fact, before the Louisiana purchase the Seminole tribe ruled Florida. The Seminole tribe was made up of runaway American slaves and Native Americans. Napoleon had French-African soldiers and government. Florida, Mississippi, what is now New-Orleans and Louisiana, that whole region was ruled by French blacks. African blacks. There was a lot of black government in the early days. The idea of blacks being slaves like the idea of Roots is a conspiracy to make all black people think that a small population of them represents the whole of them. And it’s even happening today, it’s the way they do Hip Hop. You look on TV and you see a small population of us representing the whole of us. So you would think that all Hip Hop is what you see on TV, but only those who truly study know that there was a KRS, a Public Enemy, there was a RUN-DMC. That’s crazy. Imagine, that never happened. Not that it’s inaccurate. It never happened! Imagine a story being told to you! It benefits the order. It benefits social order. Here’s where I contradict myself, because when you’re building society, you kind of need these stories. You know: cowboys killed Indians. You don’t teach that native Indians and many cowboys even became family together and intermarried. There was more of that going on than the shooting and the murder. No History is the truth. None. We are creating History. History is art. We have some bad artists, and we have some very good artists. And then we have the people and they have their own agenda. And some people take art as truth, and pattern their whole lives by it. It might work for some, but it defines the lives of so many more. African Americans are all over the United States. If there was a concentration like there is for French-speakers in Canada. If there was a region, or a State, where 80-90% of the population was African American. Would you be in favor, for the sake of true political power, of an independent African American state in North America? Because we could use the term African American more clearly. To suggest that I am African American yet I do not own Africa or America. If we had a black nation within North America that would be dope. I think that would be great! But we would still have to act humanely. We would still have to trade with whites and Hispanics and Asians and Africans. We still have to get in the world and act accordingly. And I could run America. I could run a White Nation too! We, as French-Canadians, don’t necessarily have a color, we have a language. Is there a way for French-Canadian artists who produce in French to find their way to listeners in the US? Not necessarily in the mainstream, but somewhere. Start loving your own artists. That’s what started Hip Hop in the beginning. We respected each other we held up each other. Look at my record South Bronx, that was a regional record. Why does the world sign that record? It’s a regional song! I did it for one little block! I was in a scrawny little battle and now that became what it was. Why? Because it was true to it’s time. It was true to it’s neighborhood. It was true to it’s people. What we need is a song, a Quebec! South Quebec! South! South Quebec! Or something! If English is good enough for Jesus, it’s good enough for me. -Apocryphal quote attributed to, among many, Texas governor Miriam Ferguson and South Carolina senator Strom Thurmond. How about Moses? Did he speak English? A recent poll by the Association for Canadian Studies revealed that 41% of Quebecers felt Jews did not “want to participate fully in society” and 35% felt that Jews had not “made an important contribution to society.” In the rest of Canada, 72% felt Jews wanted to participate in society and only 10% did not feel they made an important contribution to society. But what if these results simply reflected a fact? What if many Québec Jews did not want to participate in Québec society and what if their contribution to this society was, if not minor, less important than their contribution to other cultures? 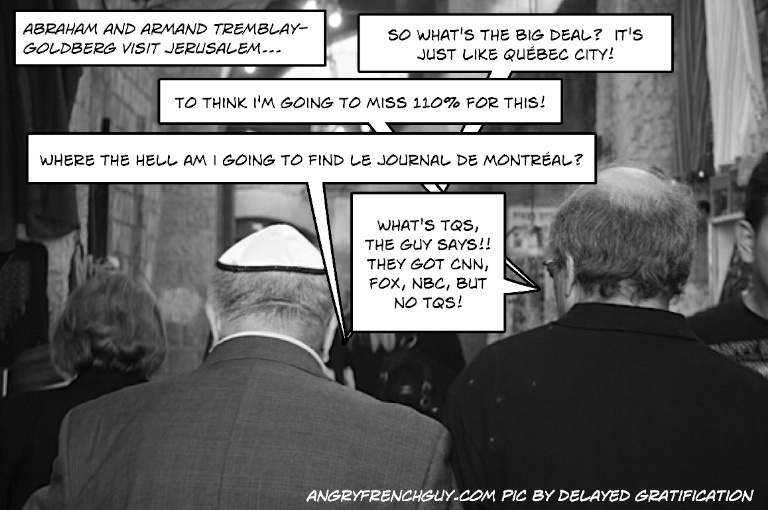 The question that the ACS did not ask is: Do you wish Jews took a more active role in Québec society and culture? Considering the considerable influence of people of Jewish decent in academia, arts, culture, literature and business, there are worse things that could happen to Québec than having a few Jews who have some allegiance to that small pocket of French-speakers shoveling away 400 cm of snow at the top-right of the North American map. Québec, whether you like it or not, is a society that recognizes itself through the French language. Most of Québec’s Jews speak another language. This means that Jewish people are not as visible in Quebec‘s editorial pages, movies and television as their numbers on the streets of Montréal would suggest. Hence, the simplistic conclusion that Jews do not want to participate in Québec society. They are here + they don’t participate = they don’t want to participate. Of course you can’t generalize! Phyllis Lambert and Julius Gray’s contribution to Québec goes way beyond the “Anglo” or the “Jewish” community. David Levine gained moderate notoriety as the Parti québécois’ most famous Jew. But the fact is that from Leonard Cohen to Mordecai Richler, the Steinbergs to the Bromfmans, the majority of Québec’s Jews have defined themselves as Anglophone Jews. It’s hard to make an important contribution to a society that defines itself almost exclusively by the use of the French language… in English. Around 20% of Québec’s Jews are Sephardic Francophones but unlike the traditional community they are mostly from a recent wave of immigration and they have yet to establish their place in either Québec or Montreal’s Jewish institutions. In the rest of Canada all Jews speak the same language as the rest of Canadians. In Québec, Jews and the French-speaking majority often don’t even go to the same schools! This situation has it’s roots in the refusal of the Catholic Church to admit Jewish kids to Catholic schools in the past. The fact is that the doors of Québec’s French-language public schools have been fully open to all confessions since 1977 and it’s Montreal’s Jewish leaders that have been at the front lines of the battle to preserve a separate English language public school network. In 2005 they even briefly convinced the Liberal government to fund a parallel network of straight-out Jewish public schools until public outcry forced them to back down. This segregation feeds the vicious of cycle of ignorance and distrust and that benefits no one. The people of Québec – old stock and new immigrants alike – are denied the opportunity to know and build relationships with Jewish-Quebecers for reasons that have nothing to do with religion, only with language. Worse, French-Quebecers are estranged from a Diaspora that is very Francophone and Francophile, and from that other small country with the blue and white flag that knows a thing or two about independence, being a minority culture and protecting an endangered language. 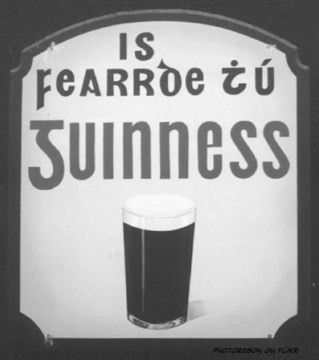 A vast majority of Irish people support the adoption of legislation to protect the rights of Irish speakers in Northern Ireland. Sixty-eight percent of some 11, 000 responders to a consultation by Northern Ireland’s government published last October responded favorably to a draft of the proposed Irish Language Act. The proposed Irish law would use a rights-based approach. That is the same philosophy behind Québec’s language law. In 2005 the Republic of Ireland removed the legal status the English-language name of 2,000 towns, villages and roads in the Gaeltacht region of western Ireland and made the Gaelic version the only one that could be used by governement and public bodies. Laval is a French language university in Québec City, which is 95% French-speaking. It’s the university of Lucien Bouchard. But English is the language of scholarly research, explained the professor. You had to be able to read and write in English, whether you were a separatist or a federalist, a communist or a neo-conservative. English was a basic tool you needed to be able to work with in order to become a political scientist, the same way that an engineer needs math. The school functioned in French, our lectures were in French and we wrote our assignments in French, but being able to read many relatively arcane monographs and articles in English was a necessary skill required to do our job as a student and in the world beyond campus. So my question is: if it is reasonable to expect political science students to understand English, why is it not required that nurses and doctors trained by McGill and the MUHC speak French? What could be a more basic skill required of a doctor or nurse that she be able to understand easily and with great accuracy the language of her patients? In Montreal and Québec the vast majority of people still speak French, as far as I know. 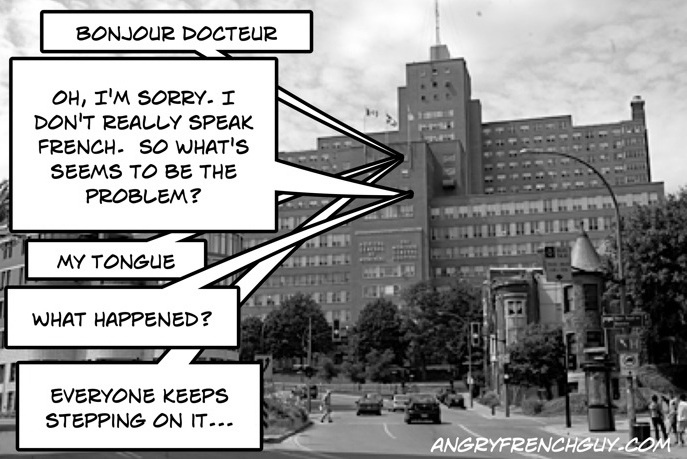 Montreal’s so-called English-language hospitals like the Montreal General, the Royal Victoria and the Jewish are required by law to be able to provide French-language services to anybody who asks for it. So how can an advanced knowledge of the French language not be an admission or graduation requirement? McGill does not require language testing of it’s students either before admission or graduation. As a result about 50% of McGill trained doctors leave Québec every year! The medical sector is not, by any means, the only one affected by this total failure of Quebec’s English higher education institutions to properly train students for the Québec job market. According to a recent study, 61% of English-speaking bachelors, 66% of English-speaking masters and 73% of English-speaking PhDs leave Québec. The vast majority of Anglo-Québécois are self-declared bilinguals, that is absolutely true. But how comfortable is someone who has only ever studied in English, from kindergarten through university, in actually working, reading, and writing in French on a daily basis? We don’t know the answer to that question because studies and census data on bilingualism in Québec and Canada usually rely on self-assessments. Actual second-language ability of students has not been tested at any point during their student career. Because the vast mass of technical and scholarly literature is published in English, graduates from French language universities are actually much better prepared to work in a multilingual environment than graduates from McGill and Concordia! McGill’s law school makes it mandatory for students to be fluent in French because to practice a legal profession in Québec’s legal system you not only need to be able to understand French, but actually work in the language. And they would have us believe that health care professionals don’t?